A snapshot of the neighborhood in 2014, in no particular order. 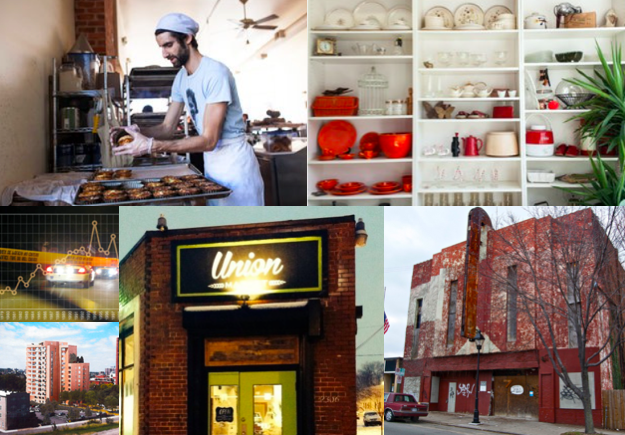 Union Market, Metzger Bar & Butchery, Urban Farmhouse, CrossFit Prelude, Jade Multicultural Salon, Seven Hills Studio, Runway Couture, Chocolates by Kelly, The Pig and Dog Show, and Urban Set Bride all opened up in 2014. Things change now… Anyone wanting to open up in the area going forward, for the most part, has to look harder to find the space – either on the older commercial spots on 25th Street or Venable Street, or in new buildings that might not even exist yet. And with 3 more years of the SEED grants lined up, business will come. The empty spaces around the edges attract larger projects. Pear Street and the Shockoe Stadium, two contentious projects at the periphery of the neighborhood, were stopped this year. Or is Shockoe really dead? Oakwood Heights (AKA “The Lofty”), another project with strong opposition, returned from dormancy this year. The East Coast Stone Brewery is proposed to bring jobs and people to Fulton. After sitting vacant since the early 1970s, the old movie theater on 25th Street is being converted to retail and living space. Better Housing Coalition’s acquisition of the Citadel of Hope on Venable Street will prove to be the stimulus that those beautiful, ragged blocks need. A lot of digital ink was spilled on eating in the area: Alton Brown, The Local Palate, Southern Living, Esquire, Southern Living, and Food & Wine all shared some love this year. The New York Times wrote on shopping and eating amidst history, and USA Today called Church Hill one of ten up&coming neighborhoods around the USA. Don’t let this get lost in the mayhem from Southside: the number of homicides in the East End is at a historic low. With only days left in 2014, there have been only 4 killings in the East End this year. The previous low was 9 (in 2009 and 2012); the area averaged just under 20 killings from 2000 to 2007 (and the 1990s were even worse). Where all of this comes together, I think, is Church Hill North. This neighborhood is primed. The Church Hill North Better Block weekend in June brought folks out to 25th Street and showed what a great common ground this street can be. A neighborhood that was only a few years ago the most vacant in the city is steadily seeing private and public infill. The North Church Hill Choice Neighborhood project offers hope that Creighton and the old Armstrong building will be born anew and transform Nine Mile along the way. A voice of caution, though. All this in one magnificent year. Thanks for the highlights. Life is good on the hill. Please note I did not say Life is good in the hood. :).